On Nov 26, a small group of terrorists launched several attacks in the city of Mumbai in India. For over three days, several bombs were thrown and hundreds of bullets were fired. Nearly 200 people died and more than 300 were injured. 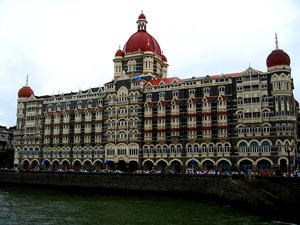 The terrorists attacked Mumbai’s largest train station, 2 famous hotels (including the Taj Mahal Hotel, shown in the picture), a Jewish center, a movie theater, a hospital, and a restaurant. These terrorists were finally stopped by the Indian commando forces. The Indian police are still trying to figure out who these people were and why they attacked Mumbai. India is the world’s largest democratic country, and the world’s second biggest country in terms of the number of people living there. Many languages are spoken in the country, but the most commonly spoken language is Hindi. There are many religions in the country, but a majority of Indians are Hindus. India was ruled by the British and got its independence in 1947. Mumbai is the biggest city in India. It has had many names over the years, and was called “Bombay” until just 12 years ago. Mumbai was ruled by the Portuguese in the 1500s and was gifted to the British in 1662 when a Portuguese Princess married an English King. The city is home to the the largest stock exchange in the world by the number of companies listed – The Bombay Stock Exchange. It is also home to one of the largest film industries in the world called Bollywood. The name Bollywood comes from “Bombay” and “Hollywood” (the American film industry). Bollywood produces about 800 films a year (that’s twice as many as Hollywood). The films usually run 3 hours long and have a lot of songs and dances. Indians love going to the movies – about 14 million people go the the theater everyday! Don’t you love it when you are given a math addition problem where you are adding a zero, or multiplying by zero, or subtracting a zero – these math problems are a breeze thanks to the “zero”. So who do we need to be grateful to for discovering “zero”? The Indians!